Here at the store we’ve been on a serious pom-pom kick, we think you will be too when you realize how easy and fun they are to make. Everything looks better with a pom-poms! The Clover Pom-Pom Maker - quick, easy, fun pompoms! is a clever little tool for making perfect pom-poms every time. Fast and easy to use, each set includes two sizes of Pom Pom Maker, approximately 2.5″ and 3.5″ each. You’ll only need about one half to one ounce of yarn, or approximately 50 yards of worsted weight yarn to make the larger size. The thicker the yarn, the less yardage you’ll need. Mix and match colors, throw in some sparkle, try making stripes… there’s no limit to the fun textures and look. 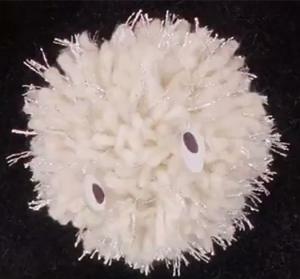 Each pom pom has it’s own character – just check out the video above to see for yourself! Clover Pom-Pom Maker - quick, easy, fun pompoms! Go ahead, try to make just one! We think once you get rolling (or wrapping) you won’t be able to make just one of these fun little stash-busters. Of course pom-poms are the perfect finishing touch on a favorite stocking cap… They’re also great for holiday decorating – think garlands, tree ornaments, or little woolen snowballs tucked into a centerpiece on your holiday table. Add one to a zipper pull or clasp on a bag, or make a bunch and create a pretty mobile for a child’s room. We even pop them on the tops of pens here at the store to dress up our desks! Grab a pom-pom maker now and get ready for stash-busting, decorating fun! How to knit! A work in progress. 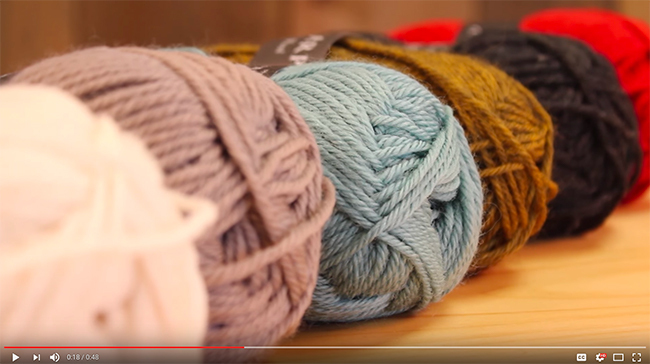 A series of how-to-knit videos. Enjoy! Jo Sharp Classic DK Wool yarn – Tried and True & on sale! Truly a classic, Jo Sharp Classic DK Wool Yarn has stood the test of time. It comes in neat little 107 yard, 50 gram skeins (we call them jelly beans). Classic DK Wool is a go-to for any knitter familiar with the line, or anyone looking for a new standard in a DK weight since it is suitable for all sorts of projects. Spun from premium grade, extra long fibers, it’s really warm and durable. 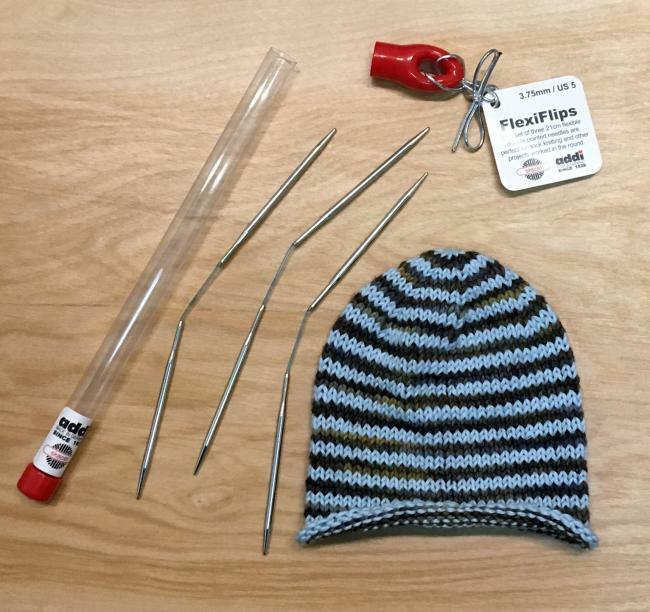 Use it to knit your favorite hat, pair of socks, blanket, sweater, mittens… you get where I’m going. And if you need to find a pattern, Jo Sharp has you covered there too. Not only does she have lots of patterns specifically designed for the Classic DK Wool, but she also recommends it as a substitution for other Jo Sharp lines such as Jo Sharp Alpaca Kid Lustre Yarn, Jo Sharp Silkroad DK Tweed Yarn, and Jo Sharp Soho Summer DK Cotton Yarn. But then there’s the Jo Sharp Empire Coat - Pattern Download, which is a favorite amongst the Halcyon staff. This pattern includes instructions for the coat in two different lengths, the longer version being the red one pictured here. Ok one more, then I’ll leave you alone… I also really like this pattern, the Jo Sharp Cable Shawl plus Unisex V-Neck Sweater - Pattern Download. I love how cozy that shawl looks. Not to mention, there are also instructions for a unisex sweater included with the shawl pattern. 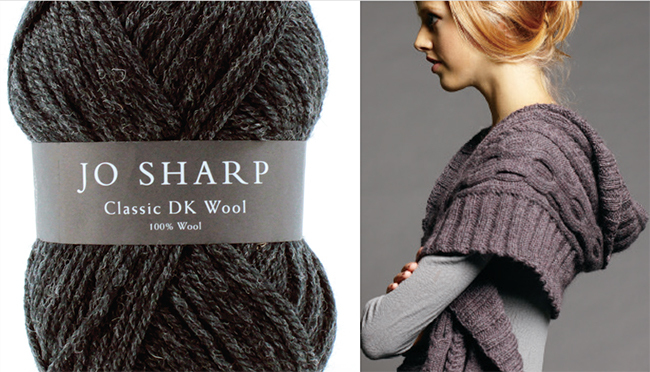 So I guess if I had to sum it up (which I do) I’d say Jo Sharp’s Classic DK Wool is a stash staple. It’s versatile, durable, and affordable without sacrificing good quality. It’s not a superwash, just all natural handwashable goodness that will last for years. Looking for a specific color? You’ll likely find it. This yarn is offered in 29 solid and heathered colors, all of which we have in stock. Stop by the shop to feel the samples, or browse the color selection online. This wool is named Classic for a reason! Plus, right now it’s on sale! Save 10% off all Jo Sharp Classic DK Wool until Friday November 11, 2016. Special introductory price – 10% off until Friday, October 28th, 2016. We’ve got another great new yarn here at Halcyon- Noro Tennen Yarn! This is a new member of the Noro family, and a unique one at that. Noro is famed for their brightly variegated, single ply yarns. Our little Noro corner in the shop is a veritable riot of color. Enter: Tennen. Also a single ply, Tennen is a much more subtle line, featuring more tonal variation in a palette of neutral colors. Tennen yarn holds its own! I knit up a swatch of our color 0270, which is a grayish sage green . You can see that it still has Noro’s trademark variegation, but in a more subdued color scheme using just the green, white, and gray. These colors make the knitted fabric look just as soft as it feels. Speaking of how it feels, I was pleasantly surprised at how soft this yarn knits up! 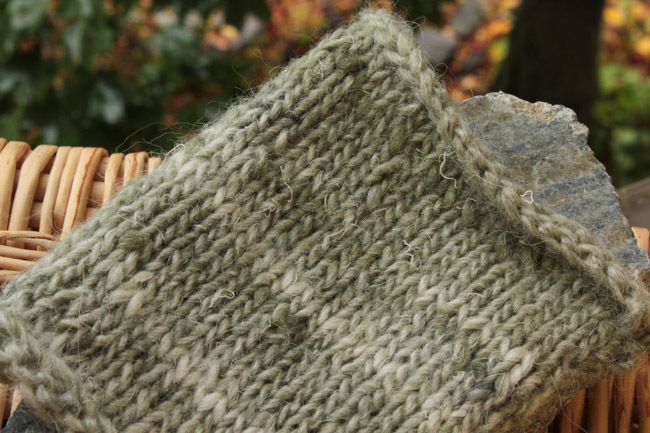 Tennen is an interesting blend of 50% wool, 25% silk and 25% alpaca. It’s soft and a little squishy; the silk pokes out in happy little threads here and there, lending the finished fabric a slightly rustic feel. Not only that, but there’s just a hint of sheen over the whole thing that catches the light and highlights the gradients from dark to light. The color palette and fiber content aren’t the only things that make Tennen stand out – it’s also a very generous put-up. Tennen is sold in 100 gram skeins, each containing approximately 275 yards. That cozy sweater I’ve been picturing out of this yarn is looking a little more attainable now! Being a worsted weight yarn, this would suit a ton of different patterns for all kinds of projects. If you’re looking for some ideas to start with, Noro also released a book specifically catered to Tennen. It’s called [Sorry, item discontinued or temporarily out of stock] – check it out! 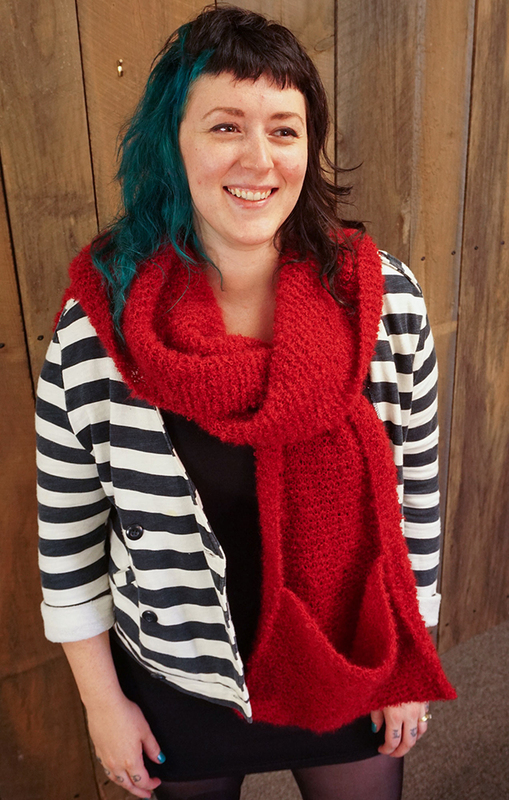 New hooded scarf knitting pattern: “Gimme Shelter” has pockets too! Why am I smiling? My new hooded scarf knitting pattern – with pockets – is here! 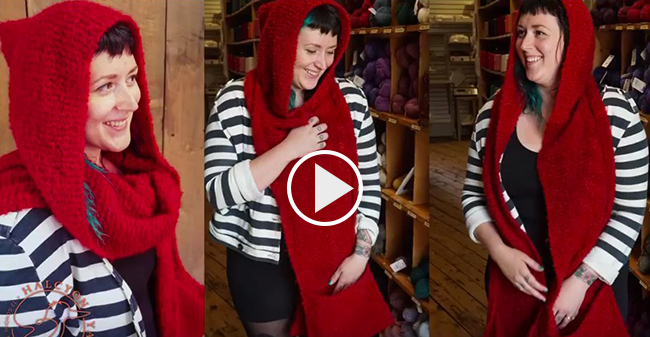 Check out my video for some tips and and tricks for the Gimme Shelter - Hooded Scarf with Pockets Download. It might not seem possible right now, but soon enough it’s gonna be winter. Especially here in the Northeast, where our summers are always so very short and sweet, we don’t really like to be reminded of the whole winter thing. I can’t speak for every knitter out there, but I can look forward to the impending cold a lot more cheerfully when I have fun projects to stitch up. My wish list is constantly being added to and I never seem to make a dent in it. Today, though, I can proudly cross off an item that I’ve been “hank”-ering to make for some time now: A big, snuggly hooded scarf! 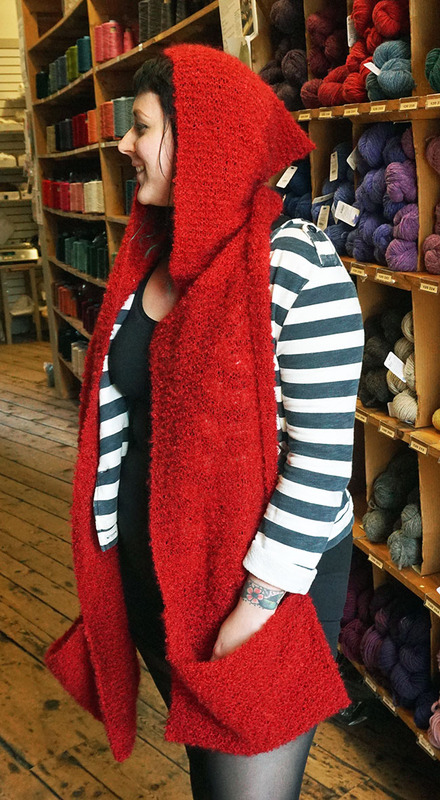 I’m not exaggerating – I have wanted to make a Little Red Riding Hood scarf since my early teens. Nothing is more appealing to me than the idea of wrapping a bunch of soft, warm fabric around my head and shoulders and hunkering down into my homemade turtle shell. What always deterred me from making my own, however, was that I didn’t ever want to tackle the hood shaping. That, and the fact that I was a teenager and didn’t have the patience to spend any length of time working on one solitary project. Well, I’ve come a long way since I was a teenager (much to my parents’ relief). At the request from my lovely coworker Kate, I decided to finally tackle the elusive hooded scarf project. We grabbed our picnic basket and skipped down to the store, full of excitement at the thought of all the yarn possibilities. After spending a long time browsing shelves upon shelves of potential colors and fibers (have you ever been to Halcyon Yarn? It’s very big! ), we landed on the Halcyon Signature Victorian Boucle Yarn. It has such a lovely drape when knitted up, and despite the mohair it is surprisingly silky – not itchy like you might expect. And because of that mohair, it is wonderfully warm and lightweight. I immediately dove for the most “Red Riding Hood” red I could find (our color 3560), and it was decided. In designing this piece, I wanted the scarf and the hood to really be continuous. So, the hood is actually fashioned after the scarf is complete. It seems like cheating but it totally works! You just fold the scarf in half (with the narrow ends together) and put a small seam from the center fold down one side, about 12.5” long. The center fold is the part that will sit on your noggin and the seam will be in the back, thus closing up and creating the hood. This makes the scarf wearable with the hood down, as this style of hood won’t be clunky and hang below the rest of the scarf with it’s pushed back. But wait, there’s more – pockets! Who doesn’t love pockets? These are done the easy way too, in a manner that I like to think the teenage me would approve of. Once the scarf is complete, you fold about 9” of each end up and stitch the side seams, creating a little pouch on each side. Whether you use them to store snowballs or just to keep your hands warm, I think these pockets add just enough detail to give the scarf some dimension and structure. There you have it – a modern, fun and easy accessory that makes a great gift for yourself or a loved one. When winter storms are threatening, warmth and style are just a hooded scarf away. Do you know Lucet? Braiding bliss intro and how-to video! Eileen has been so convincing in her enthusiasm for Lucet braiding and cordmaking we had to put her in front of a video camera. This is the result, and we hope you like it too! The lucet is a wonderful tool – wonderful for kids and adults, for travel and at home, for quick bracelets and complex cords. 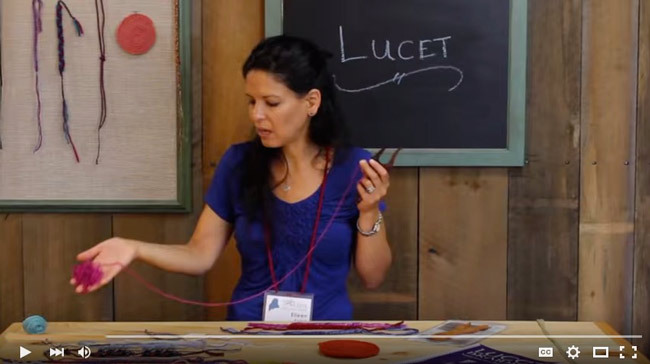 Eileen shows a basic how to on her favorite lucet, and gives some examples of what she’s made and how it fits in with her yarn and fiber arts obsessions. Hint: this is the perfect tool to use up all those beautiful loose-ends and small lengths of yarn in your stash that are too beautiful to throw away! Palm Washboard in Action – Quick, fun wet felting! A few weeks ago we introduced you to the Solid Wood Hand Felting Tool - Palm Washboard, a fantastic tool for wet felting. We’ve now gone one step further and made a video so you can see it in action. I think you’ll agree it’s one cool little tool that definitely belongs among your felting tools. This video is also a mini-introduction to wet felting (with the Palm Washboard) so if you’ve ever been curious, take a gander!